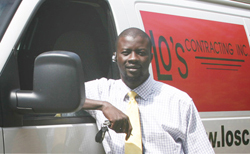 Since taking the plunge to start his own business in 2002, Amadou Lo, founder and owner of Lo’s Contracting, has expanded his service offerings and experienced increased revenues. What began as a one-man, one-truck janitorial service in 2002, Lo’s Contracting now employs 10 skilled workers operating five vehicles. Lo has expanded his firm’s cleaning services to include exterior and interior painting for residential and commercial properties, serving clients from all over the Portland and Vancouver metro areas. 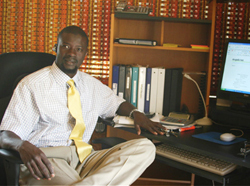 Since emigrating from Senegal, West Africa in 1999, Lo has always dreamed of starting his own business. Armed with 15 years’ experience as a clothes designer, Lo took a job repairing sewing machines at the Montavilla Sewing Center. Fluent in Wolof and French, he attended classes at Portland Community College to learn and practice English. He also drove a cab for two years, in an effort to save money to start his janitorial business. He was happy to land his first project, cleaning units in an apartment complex. The launch of Lo’s Contracting wasn’t without its snags. “Cash flow was a problem at first. Some customers weren’t paying on time. I was going door-to-door on some of my customers’ doors to collect,” he said. Eventually, cash flow issues eased, and Lo began to look at expanding his services. “On our cleaning jobs, I’d often get asked about whether we paint too,” he said. Lo partnered with a painting contractor to win early jobs and learn the trade. Obtaining a loan from the Oregon Association of Minority Entrepreneurs (OAME) has helped hasten expansion of Lo’s Contracting. Hard work, persistence and consistency have paid off for Lo, and business started picking up. Being listed on Angie’s List, a national repository of home remodeling contractor information, has helped raise awareness about the startup contractor. Angie’s List rates roofers, home improvement contractors, mechanics and other service providers in more than 30 cities on price, quality, responsiveness, punctuality, and professionalism. Lo is pleased that most of his customers have provided excellent feedback on the quality of work provided by Lo’s Contracting. "We’re focused on providing quality professional service, and work hard to exceed our customers’ expectations,” he said. “We understand that our customer’s time is valuable, so our goal is to get a project done on time, and to get it done right."